Soon after Devi Bhava ended at the MA Center in Germany, we began the drive to her program in Houten, Netherlands. We passed through charming small towns with their steeply roofed, two story houses with wooden shutters and window boxes and down through spectacularly beautiful forested hills to the flatter farming country below. Fields of yellow mustard, a symphony of greens, checkered with deep brown, rich soil in neatly plowed fields were a feast for the eye. Here and there a yellow tree had dropped its leaves like a yellow snow shower across a chocolate field. The landscape grew flatter and flatter until we began to see the canals and windmills of Holland. However, these were not the famous wooden windmills, but the modern silver metal ones that were the highest objects in the landscape. Amma had also driven directly from the MA Center in Germany. Upon arrival she went directly to the dining hall to serve everyone a prasad dinner. Not surprisingly, the Baduga music came on and Amma began dancing in her chair, leading everyone in the movements, dancing in between plates and passing plates to the rhythm of the song. Soon she was unexpectedly joined by a small green parrot. The young bird was very excited and bounced around from Amma’s shoulder to her bun and even on top of her head at one point. Amma had a few conversations with the bird and when it came time to meditate she cupped the bird in her hand and whispered in its beak for some time. After that it sat calmly on her shoulder for the whole meditation and a final rousing song. We wondered if it was in avian samadhi. The bird came to the program every day and we could hear its happy chirps off and on in the hall. The first night the Dutch ashram made a lovely display of the produce from their first garden near the stairs to Amma’s room. After the program, Amma stopped and looked at everything, appreciating their efforts very much. She picked up a small chili pepper and said that seeing it reminded her of a story from the Paris Devi Bhava. Someone had brought her a chili pepper during darshan which looked mild, as it was light pink in colour. She took a bite and discovered that it was unusually flaming hot. Amma covered it up so no one else would bite into it, but a brahmachari had seen Amma take a bite and also took a bite as prasad. Amma said that she turned around and he was panting and red as a tomato. She sent for water for him and stuffed chocolates in his mouth, but it took some time for him to recover. A lesson that we can’t emulate everything Amma does and need to use discrimination in what is within our capacity. And a reminder that all is Amma’s prasad and we can see her in everything: the song, the bird, the garden and even in the cappuccino! 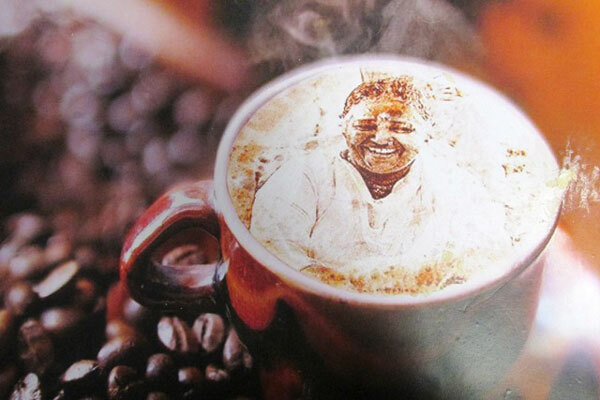 Indeed, at the express bar there was even a picture of Amma in the foam of the cappuccino, encouraging us to drink mindfully. At my seva, the University Table, we meet many successful alumni of Amrita University who are pursuing higher degrees or who have found positions abroad. They come by to see what new exciting things are happening at the university and perhaps to see old friends working at the table. We also are a meeting and information point for local universities and for people interested in working with the university in various ways. At this program, the president and 15 representatives from VU Amsterdam, a very prestigious European university came to meet Amma and discuss collaboration with Amrita. During his meeting with Amma, the president humbly said that although their university was 135 years old, they still had things to learn from Amrita. He also said that Amrita’s example had inspired them to take a stand to include social values in their curriculum. At the close of Devi Bhava, Amma stood for a long time beaming at her children and when she came out from behind the curtain to leave, she again stood beaming at them and said that she knew they had been working hard and still had a lot of work to do to clean the hall. She sweetly said that she would really like to help them clean up, but she had to soon leave to go to Finland. The devotees were really touched by Amma’s concern for them and said, “No, no. We are happy and have a lot of help to finish quickly.” Amma gave them one more glorious smile and made a gesture sweeping them into her heart and so finished the very successful Netherlands program.